Health(ier) means I can eat this more often! And it’s so deliciously creamy! Guess what? 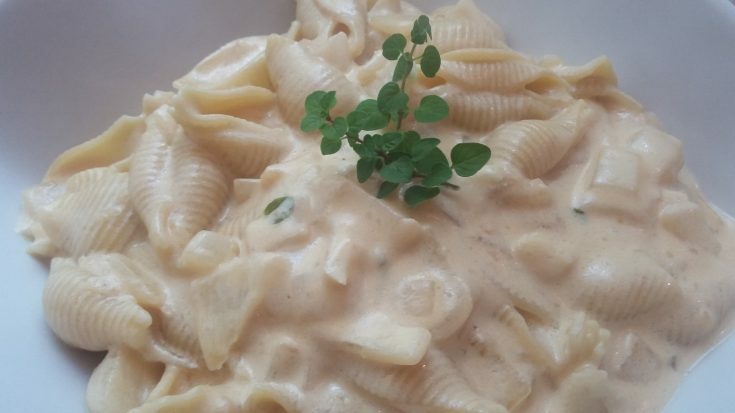 After talking with a friend about ways to use up white wine recently, I came up with a new and delicious recipe: White Wine Alfredo Sauce! I made it as a reduced fat version, so that the DH and I could enjoy it more often, with less guilt. I actually don’t believe in feeling guilty about food. Nourish yourself, nourish your body, be active, and no guilt. So I guess it’s more that I can eat my (Reduced-Fat) White Wine Alfredo Sauce with less worry about what the fat content is doing to my heart. I served it with blanched broccoli, so there’s that, right? Apparently broccoli is not only a super-food but a super-duper food, and a dash of wine is actually considered heart-healthy, so I think it was a healthy meal overall! And it’s so easy to make! Seriously! If you have a can of 1% evaporated milk, you can make this recipe! 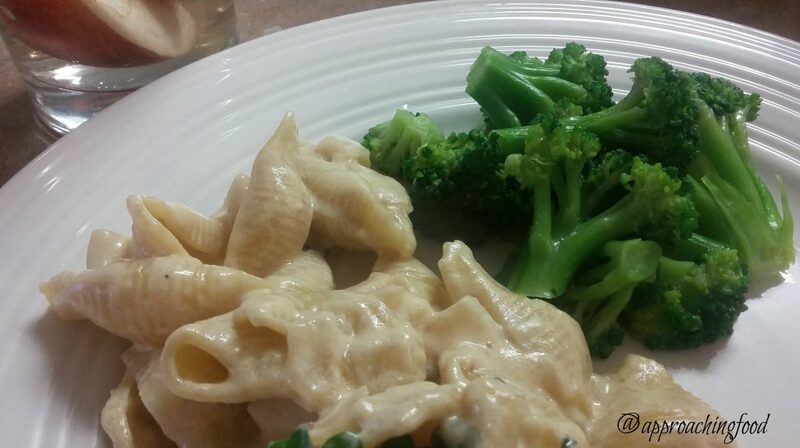 And bonus, this White Wine Alfredo Sauce doesn’t contain the preservatives that canned or jarred Alfredo sauce does. Winning! Fry the onion and garlic in the vegetable oil, over medium heat, until the onion is translucent. Add in wine and simmer for 5 minutes. Then add in the evaporated milk, bouillon, and flour, and stir over medium high heat until bubbling and slightly thickened. I tossed this sauce with shell pasta (two cups dry pasta, then cooked). The pasta will absorb a lot of the sauce, so serve it right away if you like super-saucy pasta, or wait 5 minutes after tossing the pasta with the sauce, if you prefer a thicker sauce. I served it with blanched broccoli and a glass of apple peach iced tea. Yum! I plan to put this sauce into my regular dinner rotation, as per the DH’s request. He’s not a fan of the onions in the sauce, and obviously you can leave them out, but personally, I like them. Gives a bit of caramelized-like flavour, I think. If you make this dish, let me know what you think! Are you an onions or no onions sort of person? Next Post: I made baked goods for an Alice-In-Wonderland themed party! Easily done — and I’ll show you how to make them yourself! This entry was posted in Vegetarian Main Dishes on September 4, 2017 by Margaret. Yummy!!! Have to try this. 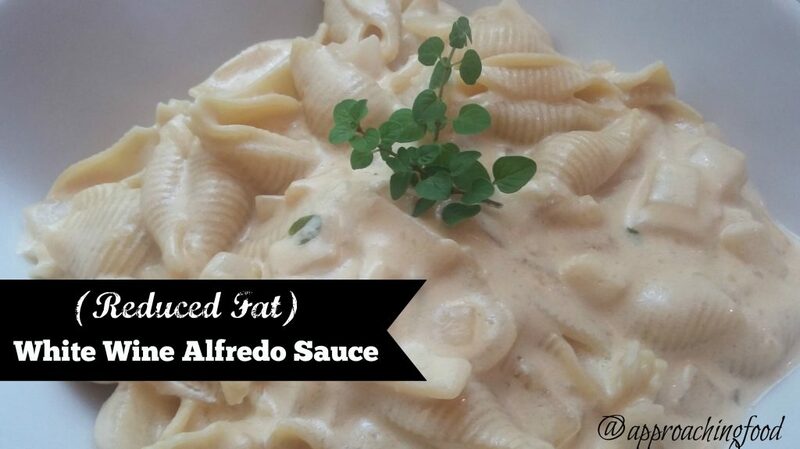 This looks like a wonderful Alfredo sauce! Thanks for sharing on Foodie Friday!